Op 19 augustus is het World Humanitarian Day. Deze dag is opgedragen aan alle hulpverleners die overal ter wereld hun leven riskeren om mensen in nood te helpen. Dit jaar staat deze dag in het teken van het geweld dat tegen deze hulpverleners wordt gebruikt. Medecins du Monde roept daarom Israël op om te stoppen met het geweld tegen de hulpverleners in Gaza. Attacks on healthcare workers, structures and ambulances should never occur: neither in times of peace nor in times of war. They represent serious violations of IHL and IHRL. 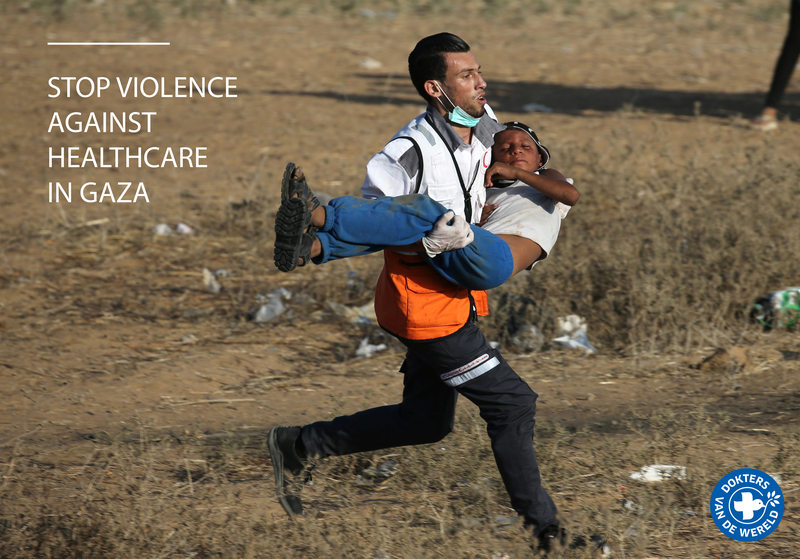 Between 30 March and 16 June 2018 healthcare workers, volunteers, ambulances and structures in Gaza have been victims of intense attacks only seen during war time. 2 healthcare staff were killed, 362 others injured, of which at least 27 with live ammunition, 12 with shrapnel, 41 were directly hit with gas canisters, and 58 ambulances damaged. And these staggering figures are clearly underreported. These attacks have occurred in a context where the health system has been challenged to its limits in terms of casualty management while also dealing with a deep structural crisis characterised by the lack of drugs, disposables, salaries and equipment. Despite the latest efforts, the international community has not been able to ensure proper accountability and protection of healthcare. Abide to UN Security Council resolutions calling for the protection and accountability of all attacks against healthcare.